Leprosy is a chronic granulomatous disease of the skin and peripheral nerves caused by Mycobacterium leprae. Among mycobacterial infections, leprosy is rare in renal transplant recipients. Here, we report the manifestations of lepromatous leprosy in a 41-year-old renal transplant recipient. Before the renal transplant, the patient had recurrent bullous lesions on his extremities with no systemic complaints. He was on an immunosuppressive regimen that included prednisolone (1 mg/kg/d), cyclosporine (6 mg/kg), and mycophenolate mofetil (2000 mg/d), and had 2 serologically confirmed acute episodes of cytomegalovirus infection that responded favorably to intravenous ganciclovir. The density of his bullous skin lesions decreased after renal transplant. During his regular posttransplant visits, we noticed a decrease in his eyebrow hairs on their lateral margins bilaterally. Later, he developed generalized, symmetric, erythematous papules. With a positive acid-fast bacilli with Fite staining, the results of a skin biopsy showed diffuse foamy histiocyte infiltration in the dermis. These findings are compatible with lepromatous leprosy. After antileprosy therapy, no deterioration of renal allograft function or lepra reactions was noted in a 4-month follow-up. Clinicians should consider leprosy in the differential diagnosis of skin lesions in immunocompromised hosts, and in particular, solid organ transplant recipients in endemic areas. Leprosy is a chronic granulomatous disease of the skin and peripheral nerves caused by Mycobacterium leprae.1 Exposure to M. leprae leads to development of the disease, unless the exposed person has an impaired cell-mediated immune response to the organism.2 Renal transplant recipients on immunosuppressive regimens are susceptible to several infections. Among mycobacterial infections, leprosy is rare in renal transplant recipients.3 However, in areas where leprosy is endemic, the possibility of infection after renal transplant should be considered.2 To date, only a few cases of leprosy in renal transplant recipients have been reported.4 Here, we report the manifestations of lepromatous leprosy in a renal transplant recipient. Knowledge of these manifestations may aid in early diagnosis and treatment of this condition. The patient’s pretransplant medical history was remarkable for recurrent bullous lesions on his upper and lower extremities, particularly on the dorsum of his hands, with no systemic complaints. Within a few days, rupture of these bullae led to formation of slightly crusted lesions. A pretransplant biopsy taken from 1 of the lesions was indicative of intraepidermal bulla. Mucosal erosion and Nikolsky’s sign were negative. After the transplant, his renal allograft was functioning satisfactorily. The number of bullous skin lesions decreased after the renal transplant. During his posttransplant visits, asymmetric erythematous macules and papules and bilateral loss of his eyebrow hair on the lateral margins and notable papules and scars were seen on his face (Figure 1). While his renal allograft was functioning normally, he developed multiple, symmetric, maculopapular rashes and erythematous papules on his chest, abdomen, and extremities in December 2009. The results of a physical examination revealed no organomegaly, lymphadenopathy, or mucosal involvement. No palpable peripheral nerves in his elbow, wrist, neck, or popliteal region were seen. Results of a neurologic examination revealed normal motor and sensory function (eg, fine touch and proprioception) in his upper and lower extremities. The results of smears of skin specimens from cutaneous lesions, and from skin folds on elbows and knees, were negative for leprosy. His upper respiratory tract and the results of ocular examinations were unremarkable. Laboratory investigations showed his first-hour erythrocyte sedimentation rate to be 21 mm, his C-reactive protein to be 2+, his serum creatinine level to be 133 µmol/L (1.5 mg/dL), his blood urea to be 7.5 mmol/L (21 mg/dL), and his cyclosporine blood level to be 119 nmol/L (143 ng/mL). The results of a complete blood count, electrolytes, blood chemistry evaluation, and microscopic analysis of urine sediment were unremarkable. Antibodies to human immunodeficiency virus and hepatitis C as well as hepatitis B surface antigen were negative. Histopathologic examination of skin punch biopsies from his left and right arms showed granulomatous inflammation with densely infiltrated, foamy histiocytes in the dermis. Fite staining was positive for acid-fast bacilli in macrophage vacuoles and in the dermis (Figure 2). These findings are compatible with lepromatous leprosy. The patient denied any history of household or intimate contact with a leprous person. The patient originally was from a rural area in the East-Azerbaijan Province in the northwest part of Iran (the second-most hyperendemic area of leprosy in Iran),6 but he had been living in an urban area for the last 20 years, so the source of M. leprae in this patient was puzzling. Thereafter, antileprosy therapy was started with dapsone (100 mg/d) plus clofazimine (50 mg/d) (unsupervised); and with rifampin (600 mg/mo) plus clofazimine (300 mg/mo) (supervised). We followed the patient for 4 months after starting him on antileprosy treatment. During this time, he showed no signs or symptoms of erythema nodosum leprosum. This report describes the occurrence of lepromatous leprosy in a man who underwent a renal transplant 3 years earlier. His lepromatous leprosy was diagnosed based on clinical manifestations (eg, madarosis; leonine face; and symmetric, generalized skin lesions) and the presence of acid-fast bacilli in biopsy specimens from cutaneous lesions. As his pretransplant evaluation, bullous lesions were not seen with Fite staining and direct immuno-fluorescence microscopy, the mycobacterial or autoimmune nature of his pretransplant bullae could not be defined. No deterioration in renal allograft function was seen during the diagnosis of leprosy or after antileprosy therapy. Most people appear to be naturally immune to leprosy and do not develop the disease after exposure. Numerous factors have been attributed to the individuals’ susceptibility to leprosy, among which, genetic factors play a role.1, 2 As immunity against M. leprae relies on intact T-cell function—after solid organ transplant and subsequent immunosuppression, changes in T-cell responsiveness and cytokine function—the clinical spectrum of leprosy may substantially alter.1, 2 Leprosy also has been described with other immunosuppressive conditions such as human immunodeficiency virus (HIV) infection. In contrast to tuberculosis, neither HIV prevalence increases among leprous patients nor does the clinical spectrum of leprosy alter in HIV patients.16 Such a lack of association might be attributed to the long incubation period of leprosy.17 Nonetheless, there are limited data to discuss the effect of leprosy on the graft or the possible effect of immunosuppression on leprosy development. Similar to the case of leprosy in a heart transplant recipient reported by Gasink and associates,2 our patient endured 2 bouts of cytomegalovirus infection after transplant. The combination of immunologic effects of leprosy and posttransplant immuno­suppression may have put him at increased risk of cytomegalovirus infection.2 The patient was treated with ganciclovir for cytomegalovirus infection and responded favorably. In addition, we followed the standard multidrug therapy for lepromatous leprosy recommended by World Health Organization: self-administered dapsone with clofazimine and supervised rifampicin plus clofazimine.1, 14 No guideline is available for managing leprosy in immunocompromised individuals at present. Nevertheless, earlier reports indicate a similar response of these patients to the standard multidrug therapy without need of modification.4, 10, 11 In solid organ transplant recipients, antileprosy therapy also requires particular attention to potential drug interactions (rifampin-induced low cyclosporine blood level) that may end in graft rejection.18 In the present report, however, neither deterioration of renal allograft function nor graft rejection was noted after antileprosy therapy. 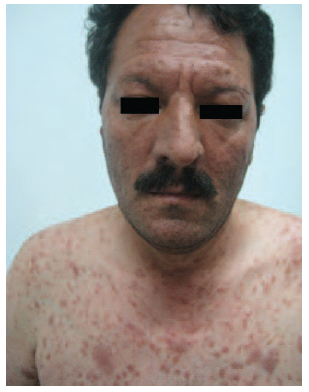 This case is an example of lepromatous leprosy in a renal transplant recipient with several unique features. Clinicians should consider leprosy in the differential diagnosis of skin lesions in immunocompromised hosts, and in particular, in solid organ transplant recipients in endemic areas. Britton WJ, Lockwood DN. Leprosy. Lancet. 2004;363(9416):1209-1219. Gasink LB, Seymour C, Blumberg EA, Goldberg LR, Fishman NO. An uncommon presentation of an uncommon disease: leprosy in a heart transplant recipient. J Heart Lung Transplant. 2006;25(7):854-856. Agarwal DK, Mehta AR, Sharma AP, et al. 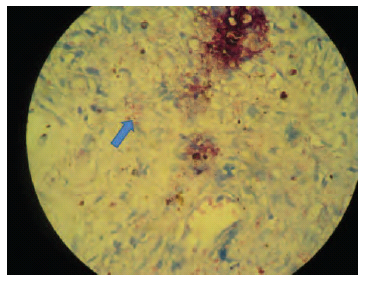 Coinfection with leprosy and tuberculosis in a renal transplant recipient. Nephrol Dial Transplant. 2000;15(10):1720-1721. Guditi S, Ram R, Ismal KM, et al. Leprosy in a renal transplant recipient: review of the literature. Transpl Infect Dis. 2009;11(6):557-562. Ardalan MR, Shoja MM, Tubbs RS, Ghabili K. Transplant renal artery stenosis associated with acute cytomegalovirus infection: resolution following ganciclovir administration. Ren Fail. 2009;31(10):982-984. Azizi F, Janghorbani M, Hatami H. Epidemiology and control of common disease in Iran [in Persian]. Khosravi Publication. Tehran. 2010:767-779. Pieroni F, Stracieri AB, Moraes DA, et al. Six cases of leprosy associated with allogeneic hematopoietic SCT. Bone Marrow Transplant. 2007;40(9):859-863. Adu D, Evans DB, Millard PR, Calne RY, Shwe T, Jopling WH. Renal transplantation in leprosy. Br Med J. 1973;2(5861):280-281. Roselino AM, de Almeida AM, Foss NT, Lima VJ, Raspanti EO, Ferraz AS. Renal transplantation in leprosy patients. Int J Lepr Other Mycobact Dis. 1993;61(1):102-105. Teruel JL, Liaño F, del Hoyo M, et al. Successful kidney transplantation in leprosy and transitory recurrence of the disease. Int J Lepr Other Mycobact Dis. 1985;53(3):410-411. Date A, John GT, Thomas PP, Jacob CK. Leprosy and renal transplantation. Lepr Rev. 1998;69(1):40-45. Mushatt DM, Wattanamano P, Alvarado FS. Lepromatous leprosy in a renal transplant recipient. Clin Infect Dis. 1998;26(1):217-218. Britton WJ. Leprosy. In: Cohen J, Powerly WG, eds. Infectious diseases. 2nd ed. London: Mosby; 2004:1507-1513. Walker SL, Lockwood DN. Leprosy. Clin Dermatol. 2007;25(2):165-172. Pardillo FE, Fajardo TT, Abalos RM, Scollard D, Gelber RH. Methods for the classification of leprosy for treatment purposes. Clin Infect Dis. 2007;44(8):1096-1099. Ustianowski AP, Lawn SD, Lockwood DN. Interactions between HIV infection and leprosy: a paradox. Lancet Infect Dis. 2006;6(6):350-360. Lucas S. Human immunodeficiency virus and leprosy. Lepr Rev. 1993;64(2):97-103. Jacobson RR, Krahenbuhl JL. Leprosy. Lancet. 1999;353(9153):655-260. Figure 1. Bilateral loss of eyebrow hair and erythematous papules on the face and chest. Figure 2. Acid-fast bacilli in Fite staining.